Adrian Curzon qualified from Cardiff School of Chiropody in 1982 as a State Registered Chiropodist. He went on to qualify as a Podiatric Surgeon in 1997. 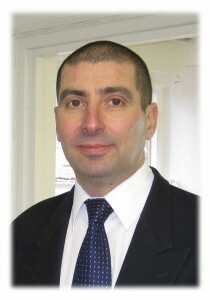 He gained extensive clinical experience working in the NHS for 9 years, before opening this practice in Epping in 1991. He now works full time at the practice in Epping and performs Podiatric (foot) surgery in Private Day Hospitals. The Epping Practice has been accredited by the Society of Chiropodists and Podiatrists. The practice complies fully with the national standards and best practice within the profession. Therefore you can be confident in the care that you receive within this Practice. Please note that the practice is situated on the first floor and does not have a lift for patients who cannot manage stairs. Please ensure that all children/under 16's are accompanied by a parent or someone who has parental responsibility. Treatment cannot be given if they attend unaccompanied. Under the new regulations for the General Date Protection Regulation (GDPR), which come into force in May 2018, we confirm that we treat your privacy seriously. We do not share any information held about you with anyone without your express consent. Data is held solely for the purpose of providing you with safe and effective treatment. If you require a detailed explanation of what data we hold and how we protect this then please ask. If you want us to remove any data held about you then please contact us.